Have you ever heard of a cameo proof coin? Are you wondering how a cameo proof coin is different from an ordinary proof coin? What about the difference between cameo proof coins and deep cameo proof coins? Proof, in coins, refers to a particular method of manufacture and the coins which result. 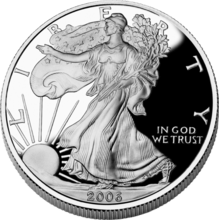 Proof coins are generally made for collectors, presentations, and other special circumstances. Therefore, proof coins are not struck for use in circulation. However, legal tender proof coins can be used to spend. There are some proof coins which do show signs of wear because they have (usually accidentally) entered circulation. What Is A Cameo Proof Coin? Cameo proof coins are distinguished from ordinary proof coins in one significant way: the raised parts of a cameo proof coin appear frosted. In other words, the plain, flat areas, called fields, have a mirror-like appearance — while the devices, the design and lettering, are not particularly reflective and actually appear creamy or white. Most proof coins struck since the 1970s are cameo proofs. Most proof coins from before the 1970s generally do not have cameo surfaces. In fact, cameo proof coins made before the 1970s are very scarce and usually demand a higher price over proof coins of the same year which don’t have cameo surfaces. A cameo proof coin typically involves a special process of die preparation. The die, which is the stamp that imprints an image on blank planchets (coins), is usually sandblasted. The sandblasting process results in the entire die surface appearing frosted. After the proof coin is sandblasted, the flat parts of the die (which create the fields) are then highly polished. The end result is a die with polished fields and frosted devices. What Is A Deep Cameo Proof Coin? Cameo coins generally are classified as cameos when the devices look whiter or frostier than the fields. However, within the classification of cameo proof coins, there are distinctions. If you have looked at any coin catalogs offering cameo proof coins, then you have probably already come across the term deep cameo proof. By the way, deep cameo is often abbreviated DCAM. Deep cameo proof refers to cameo coins with devices that are deep white. The usual deep cameo proof coin may even look black and white. In other words, the fields will look black (due to being deeply polished and highly reflective) and the devices will look white. Deep cameo proof coins are highly sought after, especially when the deep cameo proof coin is from before the 1970s. Since the 1970s, the cameo proof coin has become the rule, not the exception. This is mainly because the U.S. Mint has become even more consistent at producing a top-quality proof coin over the last number of years. Therefore, a deep cameo proof coin is very common now, and most modern proof coins exhibit deep cameo effects.